Customer support, smart and simple. 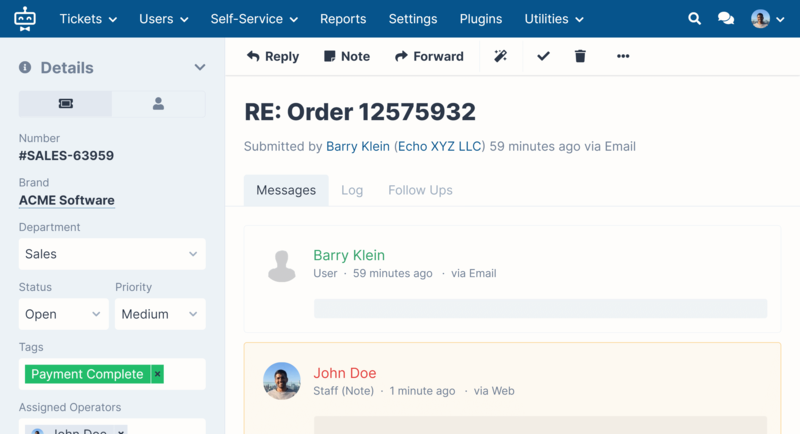 Powerful self-hosted, on-premise help desk software - easy, fast and intuitive. All support requests are directed to a shared inbox for the whole team. Updates and actions from other operators are shown in real-time, enabling greater collaboration and teamwork. Reduce your support requests workload by offering content-rich articles in a self-service area that answer your customers' most frequently asked questions and problems. Take advantage of a number of useful tools to improve and automate parts of your workflow, so that you spend less time carrying out repetitive tasks and more on offering great support. SupportPal elegantly brings all customer communication into one place. Communicate with customers via a wealth of channels - email, web, API and social media. SupportPal makes it easy to handle support requests for several companies (we call them brands) through a single backend, simplifying access for staff and management of the system. Each brand can have its own personalised frontend with a unique self-service area, and your users won't realise that the brands are connected. Brand and department permissions are completely configurable, so operators can see and deal with only what is relevant to them. Offering support in multiple languages has never been easier. SupportPal lets you translate all dynamic text; such as department names, article content and email templates; so you can offer a seamless customer support experience to users around the world. Currently using another system? Our free migration script makes it easy to move to SupportPal and keep your built-up ticket history. Several systems are supported, find out more. We've been fans of SupportPal from the day we joined! The customizable features of this software have made helping our customers quick and easy. The design makes it simple to use, even from a smartphone. Everyone we have recommended the software to loves it. We were very happy indeed when we discovered SupportPal. It is very flexible and easily customised to our individual needs. We are able to address our customers requests more efficiently and the interactive knowledgebase is helping to reduce the need to support tickets. Finding a help desk solution that fit our needs as a web hosting and IT services company was a challenge. SupportPal has allowed us to easily converge our different support channels to easily support our customers, work with sales leads, and track server changes and maintenance, all from a single platform. Get Started Try SupportPal help desk completely for free. Download our 30 day free self-hosted, on-premise trial, no credit card information required.